Disney kicked off their D23 Expo in grand fashion today, with a three-hour panel that showcased a slew of Disney and Pixar animated movies. Among these upcoming projects were Moana, set for release on November 23, 2016, The Good Dinosaur, arriving November 25, 2015 and Inside Out: Riley's First Date, a new Pixar short film that will be included with the Inside Out Blu-ray and DVD, debuting November 2. Fans at the convention were shown footage from all three movies, although it isn't known when these videos may be released to the public. Until then, we have some new photos and details for you to check out. Dwayne Johnson (San Andreas, Furious 7, HBO's Ballers), who lends his voice to the mighty demi-god Maui in Walt Disney Animation Studios' Moana, hit the stage at D23 Expo 2015 this afternoon. Renowned directors John Musker and Ron Clements (The Little Mermaid, The Princess and the Frog, Aladdin), and producer Osnat Shurer (Oscar-nominated Pixar shorts One Man Band, Boundin) shared dazzling early test footage and revealed plans for the film's inspired music and the extraordinary team behind it. Tony-winner Lin-Manuel Miranda (Broadway's hottest new hit "Hamilton," Tony-winning "In the Heights"), Grammy-winning composer Mark Mancina (Speed, Tarzan, The Lion King) and Opetaia Foa'i (founder and lead singer of the world music award-winning band Te Vaka) blend their diverse and dynamic talents to help tell the tale of a spirited teenager who sets out to prove herself a master wayfinder. Foa'i capped the presentation with a show-stopping performance illustrating the magic of the movie's music. Moana sails into U.S. theaters on Nov. 23, 2016. Moana introduces a spirited teenager who sails out on a daring mission to fulfill her ancestors' unfinished quest. She meets the once-mighty demi-god Maui (voice of Dwayne Johnson), and together, they traverse the open ocean on an action-packed voyage. Directed by the renowned filmmaking team of John Musker and Ron Clements (The Little Mermaid, The Princess and the Frog, Aladdin), Moana sails into U.S. theaters on Nov. 23, 2016. Anticipation for Disney·Pixar's The Good Dinosaur was amplified when director Peter Sohn and producer Denise Ream shared breathtaking sequences with fans, including never-before-seen footage of a trio of T-Rexes in action. In theaters on Nov. 25, 2015, The Good Dinosaur features Arlo, a sheltered Apatosaurus who finds himself far from home among a host of intimidating creatures. The Good Dinosaur features the voices of A.J. 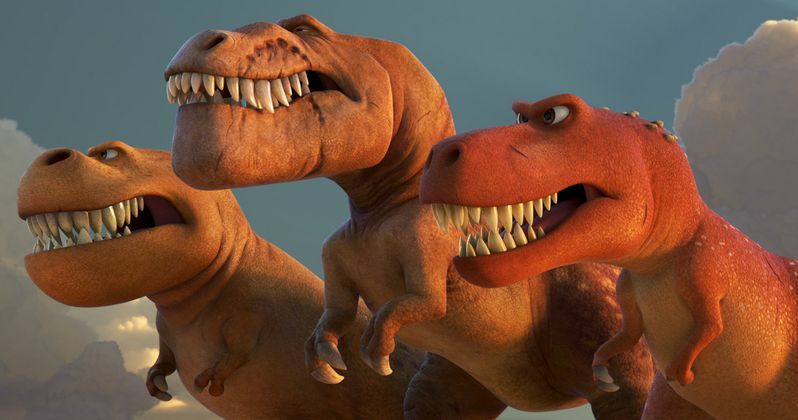 Buckley, Anna Paquin and Sam Elliott as the T-Rexes, The Good Dinosaur opens in theaters nationwide Nov. 25, 2015. Pixar Animation Studios heads back inside the mind with an all-new short. Inside Out: Riley's First Date made its world premiere this afternoon at D23 Expo 2015. Director Josh Cooley, along with Inside Out filmmakers Pete Docter (Up, Monsters Inc.) and Jonas Rivera (Up), introduced the short, which revisits Riley, now 12, who is hanging out with her parents at home when potential trouble comes knocking. Mom's and Dad's Emotions find themselves forced to deal with Inside Out: Riley's First Date. The short will be included as a bonus feature in the digital HD & Blu-ray releases of Disney·Pixar's Inside Out, which will be available digitally Oct. 13 and on Blu-ray Nov. 3, 2015. While we wait for the footage shown today to debut online, check out photos from The Good Dinosaur and Inside Out: Riley's First Date, along with the new Moana logo.